1.Marinade minced meat with salt,red chilli powder,turmeric powder,ginger garlic paste,brown onion,all spice powder and whole spices. 2.Add in yoghurt,roasted and grinded coconut,almonds. 3.Finally add in green chilles,coriander leaves and mint leaves. Transfer the marinated meat to a vessel which has a air tight lid,so that no steam can escape. 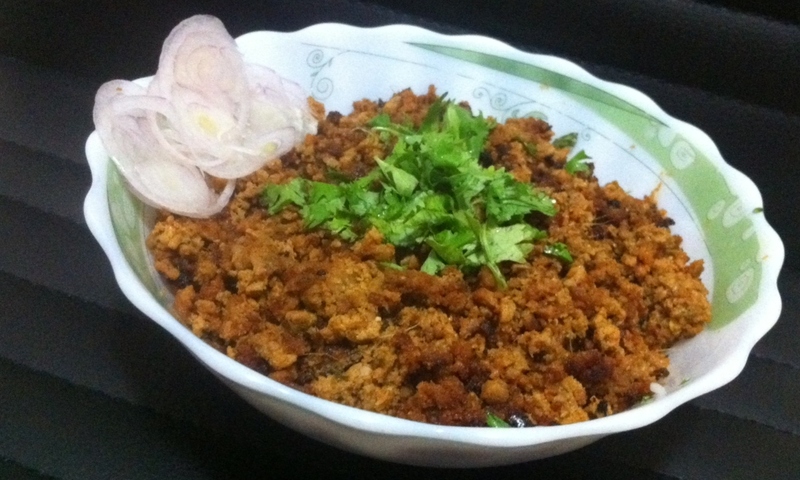 Take a small cup,fill it with desi ghee and place it in the middle of the marinated meat. Now heat a charcoal to red hot in colour and slowly using a spoon put it inside the cup containing desi ghee. Immediately close the lid and leave this vessel aside for 40minutes. Throw away the charcoal piece and add the remaining ghee to the marinated meat. Also add in oil(use the oil that was left after frying onion). Transfer the mixture into a baking tray(preferably use a large one)so that the meat layer is thin. Preheat the oven at 180degrees for 10minutes. Put your baking tray in the oven and cook till about 45minutes. The meat should turn brown in colour. Take care not to open the grilling knob. For a nice roasted brown colour you can grill for 2-3 minutes at the end (be very careful not to burn the meat). Lastly garnish with sliced onion,lemon and coriander leaves. I'm confused about what happens with the charcoal please can you clarify how it is used. i mean surely if you put charcoal on the ghee bits of the charcoal may flake off? and mix into it. Please can you let me know what you mean :) Thank you lots! Use charcoal Which is coin or small square shaped. Alternatively u can use any charcoal, heat it hot and place in a cup which already has ghee in it. Keep this cup in the container which has minced meat. The flames actually give the taste. The left over ghee can be used as it hardly has any flakes . Try it out and u Ll love it. It was my first time making this and it was awesome! The coal taste did come through my parents were impressed!! I cut back on the red mirchi powder though and did one green chilli. My family loved it thanks so much :) have you got a recipe for chicken kebabs Anjum! Want to make Dum ka Keema sans step number four. Instead of baking can i cook it the conventional way in a vessel after giving it a dum ? If yes please guide. I would like to make Dum ka Keema sans step number 4. Can i cook it in a vessel in a traditional way instead of baking it in a oven ? If yes please guide. Instead of baking, you can fry in a kadai till the colour turns golden brown. Make sure it's completely dry to get the right taste. Thanks for the recipe. It is easy and delicious.